First choir show after a long time is set to showcase tonight April 27 at 7 pm for 1$ admission. The Performing Arts Magnet has four different departments that students who enroll can be apart of. Dance, acting, stage tech and singing. The most popular ones being acting and dancing because it allows students to be apart of the school plays which involves all four aspects of what the PAM magnet is about. Dance shows are also very much talked about but the one that ever really gets any recognition is choir or also known as singing. Many students have always questioned why choir does not get their own time to shine like the other two more popular performing arts. Reasons why choir has not really done anything over the past year and a half is because Mr.Sexton who was the singing teacher had to leave for personal reasons very suddenly. Leaving choir without an instructor and having substitutes coming in and out of the small choir room had students not knowing what to do. Many students were upset knowing that they joined the class to do a hobby that they enjoyed and actually showcase it, but was quickly taken away due to miscommunication with school staff. After a year students finally welcomed their new choir teacher and have been preparing for their small showcase in dedication of 100 years of Broadway music. 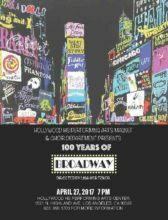 If you don’t have anything to do tonight and have finished studying for your upcoming tests and finished all your homework, go out and support choir and enjoy the 100 years of Broadway Music Celebration.